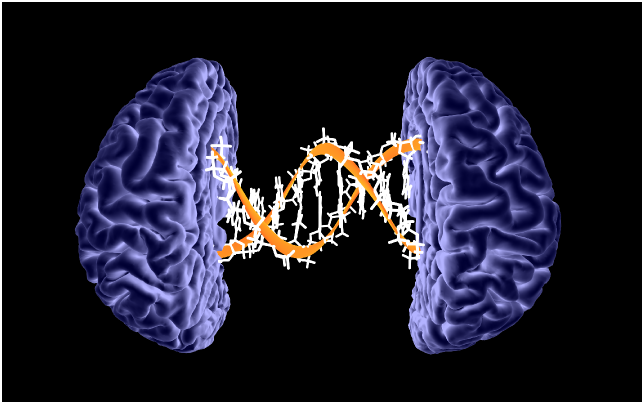 Study identifies a genetic risk score for Alzheimer’s disease in young adults. Alzheimer’s disease (AD) is common and highly heritable with many gene variants associated with it. However, the genetic risk for AD have not been clearly delineated, with the stage of Alzheimer’s before symptoms show estimated to last over a decade. Given that current clinical trials are testing whether therapies can slow memory and thinking decline among people at risk for the disease, it is critical to understand the influence of risk factors before symptoms are present. Now, a study from researchers at Massachusetts General Hospital shows that a genetic risk score may detect those at higher risk for Alzheimer’s disease long before symptoms appear, even possibly in healthy young adults. Previous studies show that some diseases are caused by a genetic mutation, or permanent change in one or more specific genes. If a person inherits a genetic mutation from a parent that causes a certain disease, then he or she will usually get the disease. Sickle cell anemia, cystic fibrosis, and early-onset familial Alzheimer’s disease are examples of inherited genetic disorders. Identifying genetic variants may help researchers find the most effective ways to treat or prevent diseases such as Alzheimer’s in an individual. This approach, called precision medicine, takes into account individual variability in genes, environment, and lifestyle for each person. The current study investigates the associations between genetic risk and AD markers in stages preceding the clinical symptoms of dementia using data from 2 large observational cohort studies. The current study calculated a numeric score based on whether or not a person has several high-risk gene variants, in 166 people with dementia and 1,026 without dementia. The lab looked for specific markers of Alzheimer’s disease in participants with an average age of 75. The markers included genetics, memory and thinking decline, clinical progression of the disease and the volume of the hippocampus, known as the memory center of the brain. The group also looked at links between the risk score and hippocampus volume in 1,322 healthy, younger participants between the ages of 18 and 35. Results show that within older people free of dementia, a higher polygenic risk score was associated with worse memory and smaller hippocampus at the start of the study, accounting for 2.3% of the total variance in memory and 2% of the variance in hippocampus volume. Data findings show that over the three years of the study, a higher score was also linked to greater longitudinal memory and executive function decline and clinical progression of the disease. Finally, the researchers associated the risk score with overall disease progression, with 15 of 194 participants that were cognitively normal at the start of the study developing mild cognitive impairment or Alzheimer’s disease, and 143 of 332 with mild cognitive impairment at the start of the study developing Alzheimer’s disease after three years. The lab note that each standard deviation increase in polygenic risk was associated with a 1.6 times increase in risk of clinical progression. Results show that within the younger group, a higher risk score was tied to smaller hippocampus volume and for the younger group, the risk score accounted for 0.2 percent of the difference in hippocampus volume between those with high and low risk scores. The team surmise that their findings show genetic risk factors for AD may be detectable even in young adults and stress that a larger numbers of participants will need to be studied to validate these results. For the future, the researchers state that the goal of this type of research is to help physicians better identify those at high risk of dementia so that future preventative treatments may be used as early as possible.